Indulge Nourish Sustain: Super Smoothies! 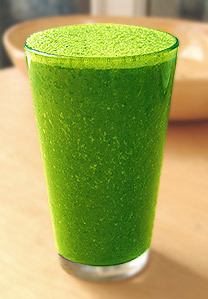 Every morning I love to start my day with a cleansing an energising super smoothie. Kimberley Snyder, superstar nutritionist for the likes of Drew Barrymore, Eva Mendes... believes we should only ever eat fruit in the morning. If eaten after this it can sit on top of the foods we have eaten throughout the day, rot in our stomachs and lose a lot of their nutritional content. Because fruit moves through our digestive systems so quickly it should only be eaten on an empty stomach so that it can move efficiently through our bodies and we can obtain the maximum nutritional benefits. So when making my smoothies I throw in whatever fresh fruit is in season as well as a handful of frozen berries and a teaspoon of Ultimate Greens, containing decent doses of Spirulina, Barley Grass and Chlorella. These are natures most 'highly concentrated nutrient rich whole-foods' that provide our bodies with energy, balance the acid-alkaline in our system and helps to get rid of the bodies waste and toxins. On a budget, with only a basic blender this is the easiest smoothie for me to make every morning, however there are so many amazing smoothies and juices out there that contain fruit and vegetables with bucket loads of essential minerals and vitamins. I'll post some up in coming weeks just in case anyone wants to give them ago. Do you have a favourite super smoothie recipe? Follow me on my nutritional journey as I discover a new way of eating! Cant't stop eating these Rice Paper Rolls!